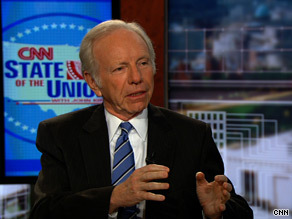 WASHINGTON (CNN) - Pushing a health-care reform package through Congress without significant Republican support would be "a real mistake" for President Barack Obama, Sen. Joseph Lieberman warned Sunday. Lieberman, an Independent who caucuses with Democrats, said trying to "jam through" a package "that the public is either opposed to, or of very, very passionate mixed minds about" would be bad "for the system." He added, "Frankly, it won't be good for the Obama presidency." "He has got other fights to fight," the senator from Connecticut told CNN's "State of the Union," citing climate change, financial regulatory reform, and the war in Afghanistan. The warning from Lieberman - who supported Obama's opponent, Republican Sen. John McCain, in last year's presidential election - came as some Democrats signaled increased willingness to consider ways to push through a plan. "We prefer a bipartisan approach," Sen. Chuck Schumer, D-New York, told NBC's "Meet the Press." Democrats led by Obama have "bent over backwards" to win support across the aisle, Schumer argued. But, he said, "We are now looking at the alternatives because it's looking less and less likely that... the Republican leadership in the House and Senate will want to go for a bipartisan bill." The tactics being considered, Schumer said, "include just getting 60 Democratic votes and maybe an occasional Republican here or there... They include looking at reconciliation, which only needs 51, and they include a combination." In the spring, Democrats put a health care "reconciliation" into the 2010 budget. Reconciliation, a type of budget maneuver that requires only a simple majority, can pass with only 51 votes, instead of the 60 needed to break a filibuster. The possibility of resorting to such a maneuver infuriates some Republicans. "That is really sort of denying democracy," Rep. Paul Ryan of Wisconsin told "FOX News Sunday." Sen. Orrin Hatch, R-Utah, told NBC it "would be an abuse of the process." Still, Hatch said, he expects it to happen. "I said from the beginning that they're going to go reconciliation." Some Democrats expressed discomfort with the idea Sunday. "I think the vastly preferable way is to go the 60 route - and with 60 Democratic senators, I think that can be done," Sen. Arlen Specter, a former Republican who switched parties this year, told "FOX News Sunday." "I think the 51 approach is not desirable. As a very last, last, last resort, if you can't get anything else, I would consider it. But I think that is undesirable." And Sen. Kent Conrad of North Dakota, one of the Democrats working to hammer out a bipartisan bill, argued that using the reconciliation tactic "does not work very well." "When you examine the way reconciliation works, it was designed solely for deficit reduction... It never contemplated substantive legislation," he told CBS' "Face the Nation." While the debate has been raging, one of the most prominent figures in the Senate, a Democrat who has fought for health-care reform for decades, has been absent. Sen. Ted Kennedy suffers from brain cancer. His absence is felt, said Sen. John McCain of Arizona, last year's Republican presidential nominee. "No person in that institution is indispensable, but Ted Kennedy comes as close to being indispensable as any individual I've ever known in the Senate," McCain told ABC's "This Week." "He had a unique way of sitting down with the parties at a table and making the right concessions, which really are the essence of successful negotiations."